Numerical control (NC) has been developed due to the need for higher productivity, lower cost and more precise manufacturing. 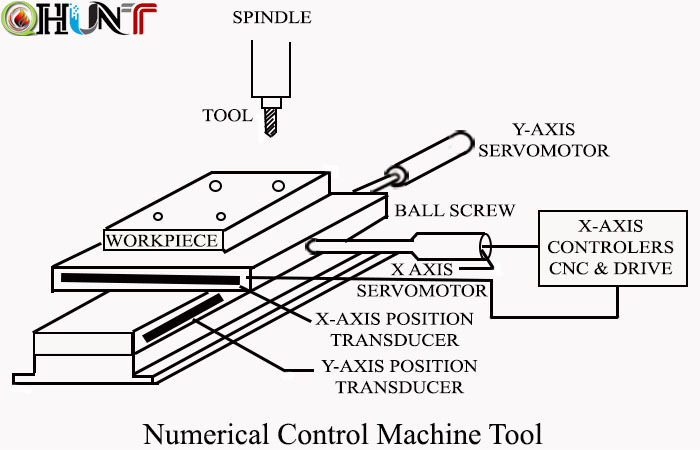 In Numerical Control system, operation instructions are input to the machine as numbers, which are suitably coded for storing on cards or tapes. These executed instructions are then automatically executed by the machine tool in pre-determined sequence with pre-set or self-adjusted speed, feed, etc. without human intervention. Avoidance of human intervention, omission of conventional tooling and use of fixtures and quick-change capability of NC system are the primary factors considered to decide the level of acceptance of NC machine tools for a particular job. The control systems and machine tools in numerically controlled machine tools have varying complexities and capabilities. In the initial stages, the NC machine tools had NC systems added to the machine but only to control the position of the work piece relative to the cutting tool. The operator had to select the cutting tools, speed and feeds etc. In the next stage, the capabilities of the machine tools improved and in addition to maintaining cutter and work piece relationship, the material removal was also controlled by the numerical control system. The mechanical design of the machine tool was also improved with the development of recirculating ball screw and better slide ways. These machines are referred to as NC machines. The instructions to the NC machines are fed through an external medium, i.e. paper tape or magnetic tape. The information read from the tape is stored into the memory of the control system called 'buffer storage' and is processed by the machine step by step. So when the machine is working on one instruction block, the next block is read from the tape and stored in the memory of the machine control system. Since the part cannot be produced without a tape being run through the machine, these machines are also called tape controlled machines. The tape has to be run repeatedly depending on the number of components to be produced. Also if there is even a minor change in the design of the component, the tape has to be discarded and new tape with changed program has to be produced.